Bifurcating Patterns by Edward Belbruno (2010, oil on canvas, 36x 48 inches). Edward Belbruno is a mathematician and an artist. 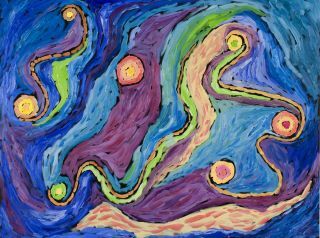 His paintings are in major collections and exhibited throughout the United States, and he regularly consults with NASA from his position as a cosmology researcher at Princeton University. He is also author of "Fly Me to the Moon" (Princeton University Press, 2007). Belbruno contributed this article to Space.com's Expert Voices: Op-Ed & Insights. One of the biggest questions in science is, "How did life first emerge on Earth?" There are many theories, but for the last decade, I have been particularly inspired by one: the lithopanspermia hypothesis. The hypothesis posits that rocks seeding Earth life came from planetary systems outside our own, planets that orbited the young suns that shared space with our own in a now dissipated "birth cluster" of thousands of stars. Research by F. Adams and G. Laughlin in 2001 implies that the stars in such clusters form a loosely bound aggregate, with each solar system moving relatively slowly with respect to its neighbors (about 1 kilometer per second). Rocks — or more precisely, planetesimals — can become dislodged by collisions and other events, escaping out of a given planetary system to drift within the space between the cluster's stars, eventually becoming captured by another star of the cluster. Once within its new solar system, the planetesimal would be drawn into one of the orbiting planets, crashing and releasing its contents — including any biogenic material. If that occurred on the early Earth, perhaps in some warm water in a primordial lake or ocean, those scattered molecules may have eventually led to the formation of our planet's life. Electric Ergodic Motions by Edward Belbruno (2010, oil on canvas, 30x40 inches). I was introduced to the lithopanspermia hypothesis in 2004 by the Princeton University astrophysicist David Spergel and was immediately intrigued. However, there are two gaps in the hypothesis. The first asks how life could emerge from the biogenic material, a subject I left for others to address — because for that problem to exist, the rocks first must arrive on Earth. That is the second gap in the hypothesis: the transport problem. What is the dynamic mechanism that would allow a rock to be flung out from a planetary system and be captured by another star, and ultimately, one of its planets? Previous work by H. Jay Melosh suggested there is a near zero probability of gravitational capture of a rock from one star system by another within a shared birth cluster. Since the likelihood of capture by a star would be near zero, then the probability of crashing on a planet, would also be extremely small. The researchers obtained this result because they assumed a high ejection velocity from the rock's original planetary system: approximately 8 kilometers per second. At such high velocities, a rock would just rapidly fly by any nearby stars, traveling much too fast to be captured. However, it seemed clear to me, and also to Spergel, that if the ejection speed were much slower, then capture at another star may be possible. From my previous work on such a process, called ballistic capture, slow ejection leads to slow capture. Ballistic capture is a type of capture where an object becomes gravitationally bound at a star and goes into orbit about it, which is accomplished purely by the stars gravitational attraction and no other forces. I studied ballistic capture for use with lunar spacecraft, where the craft is pulled into the moon's orbit about without expending any fuel — the craft relies only on the gravitational pull of its destination. So as I studied lithopanspermia a decade ago, it seemed clear that the way to solve the transport problem was to find ballistic capture trajectories from a rock's origin star to its destination — Earth's sun. In my lunar spacecraft work on ballistic capture, my unconscious mind actually found, within brush strokes, the needed trajectory to the moon. In the lithopanspermia problem, routes are sought between stars. So in 2010, I did a series of paintings on that problem. They weren't meant to find a particular route, but rather to help me visualize and organize my thoughts. This gave me a more intuitive feeling about the problem I could not have obtained in any other way. The paintings all showed connections between star-like objects, as ballistic capture trajectories might appear if envisioned physically in an abstract manner. Diophantine Flow by Edward Belbruno (2010, oil on canvas, 36 x 60 inches). From the paintings, I realized that ballistic capture trajectories between the stars were fairly direct and did not perform unusual dynamics. Also, the paintings showed that they occurred between stars fairly close to each other. This told me that it was quite likely, giving hope of finding them. After eight years of work with Amaya Moro-Martin of the Space Telescope Science Institute, Renu Malhotra of the University of Arizona and Dmitry Savransky of the U.S. department of Energy's Los Alamos National Laboratories, we had cracked the problem. We showed that with ballistic capture, the probability of a star capturing a rock from another in a birth cluster was not near zero — in fact, we improved the probability by many orders of magnitude. We simulated millions of such trajectories, and that is exactly what happened. Our results imply that the probability of a rock eventually crashing onto an Earth-like planet after capture by its sun becomes almost a certainty, given that we calculated the number of rocks drawn into that solar system to be on the order of 10,000,000,000,000,000. That compares with the probability of a single rock entering such a model solar system in the research by Melosh. From the huge number of rocks we estimate entering a solar system, we think approximately 10,000,000,000 of those would crash onto an Earth-like planet. We published the findings in 2012 in the journal "Astrobiology" and the work ultimately appeared in "Time Magazine," with a cover mention, in October of that year. Our results are consistent with the geological evidence for the emergence of life. Many millions of years pass between the time a rock is ejected from one star and its eventual capture by another. But that time is less than required for an open star cluster to naturally disperse to a point that transfer of rocks is no longer possible. Those same time scales fit into the hypothesis for when water formed on Earth, so it is likely the planet's surface hosted a good environment for any biogenic material to form more complex molecules. And geological evidence shows that bacterial life emerged not too long after that period: about 3.85 billion years ago. Note: Meet Belbruno on Oct. 22 in New York at a Space.com gallery showing highlighting his work. Belbruno's art is available exclusively in the Space.com store.